Jockey Noel Fehily ended a 21-year career that yielded more than 1,300 victories with a win in his final race. The 43-year-old Irishman, who has won the Champion Hurdle twice, was greeted by a guard of honour before the final race of the day - the Bumper - pushing favourite Get In The Queue to win. 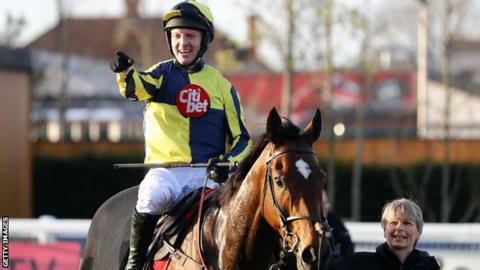 "That was fantastic; I'm overjoyed the plan came off," said Fehily, who announced his retirement at Cheltenham. "He's a very smart horse and I'd have been disappointed if he didn't win." Fehily announced he would call time on his career after guiding 50-1 shot Eglantine Du Seuil to victory at Cheltenham on 14 March. Earlier this week he said Newbury would be his swansong and it was a fitting finale given he has been based in the nearby Lambourn area for most of his career. He won the Champion Hurdle with Rock On Ruby in 2012 and Buveur D'Air in 2017. His other notable successes include victory on Special Tiara in the Champion Chase at Cheltenham in 2017, along with back-to-back triumphs in the King George VI Chase at Kempton Park on Silviniaco Conti in 2013 and 2014. Get In The Queue's trainer Harry Fry admitted he was feeling the pressure to send Fehily out on a winner. Sent off as 1-3 favourite, Get In the Queue came under pressure in the two-mile Bumper race but found enough in the final two furlongs to seal his third-straight win. The wide-ranging tributes to Noel Fehily tell their own tale - a jockey respected by colleagues, trainers, owners and punters. Champion jockey Richard Johnson called him a brilliant rider, but an even better man. Fehily was an understated hero - the 'go to' man when you needed a reliable rider for the big occasion. The only surprise as he retires is that it took so long for some people to cotton on to his talent - his biggest wins have come in the last third of his career.